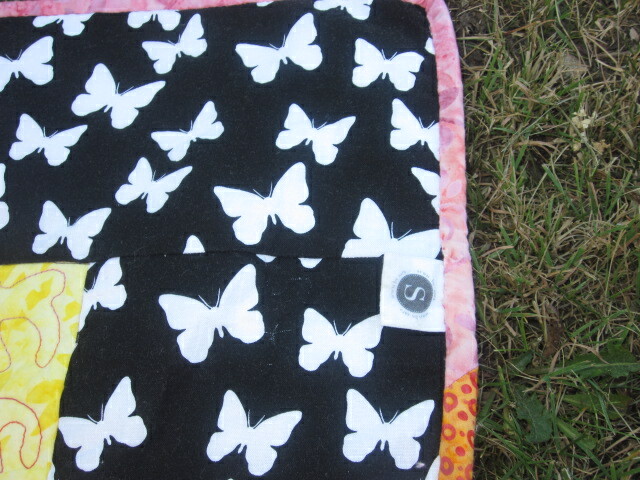 I thought it could be part of a very sophisticated quilt for a baby girl. The fabric isn’t too babyish, and I could see a teenage girl liking it every bit as much as a child would. 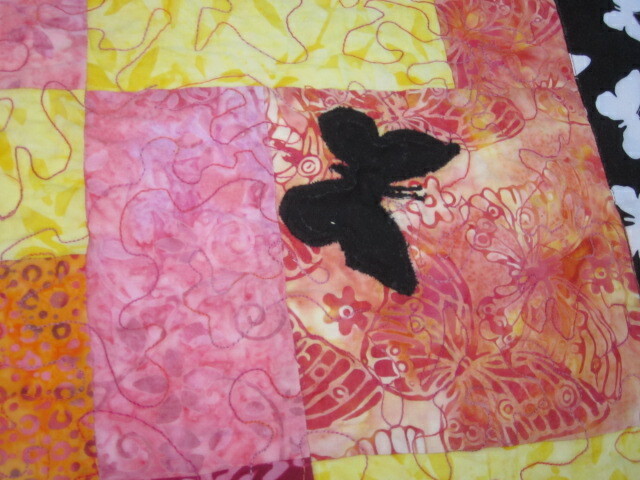 To match the intensity of the black-and-white fabric, I decided to go with bright colours. 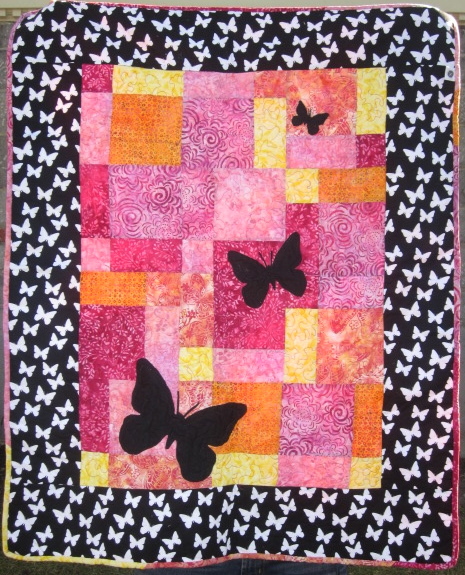 At first I was thinking of colourful geometric prints, but then I saw some batik fabrics and realized that their softness and low-contrast patterns would be a lovely foil for the sharpness of the butterflies. And so a quilt was born. The centre is what’s called a disappearing nine-patch. The placement of the blocks is semi-random, which to my mind means that I didn’t want it to look like an orderly repeating pattern. 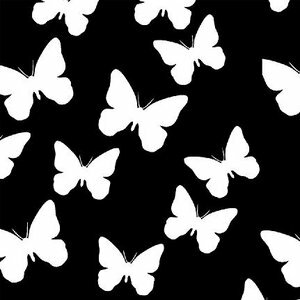 I created the black appliqued butterflies by scanning and enlarging the inspiration fabric, tracing it onto the black cotton, and then cutting out the shape. I have to say that I absolutely love using Minky as a quilt backing. 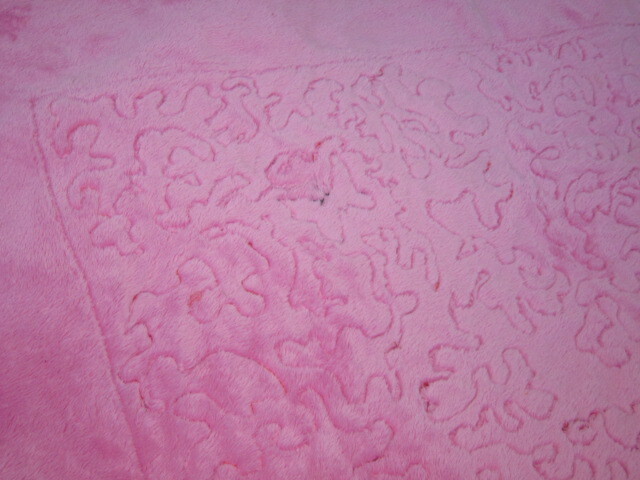 It’s so soft and cuddly, and it also shows off the quilting very nicely. I made a pieced binding for the quilt out of leftover batik fabric. Early on someone questioned my choice to do a colourful binding instead of just letting the black butterfly fabric fade into a black binding, but I stand by my decision. I think it frames the whole quilt and makes it feel cohesive. Don’t you? I find it hard to part with a finished quilt. I really wanted to keep this one, maybe hang it in the living room to admire for a while, and then use it as a throw for the couch. In the end I gave myself a stern talking-to, wrapped it up, and delivered it to the intended recipient. 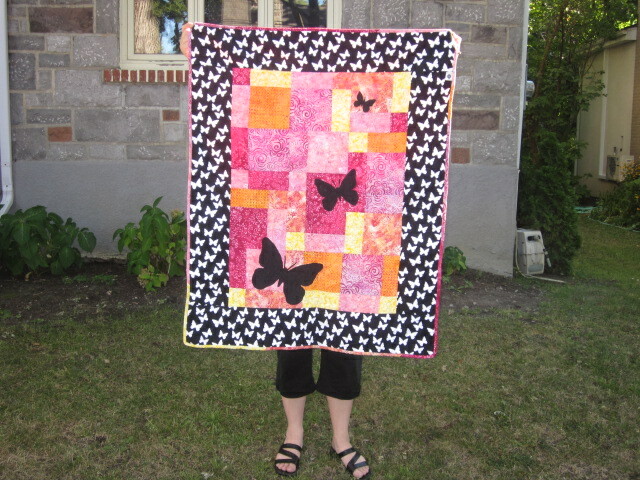 It helped that she loved the quilt and made a big fuss over it. I couldn’t help but give the quilt a loving stroke and a quick cuddle before handing it over for good and driving off into the sunset… and noticing that the sunset wasn’t quite as exciting as the one I’d quilted. As we’ve previously discussed, stay-at-home moms don’t get summer vacation. 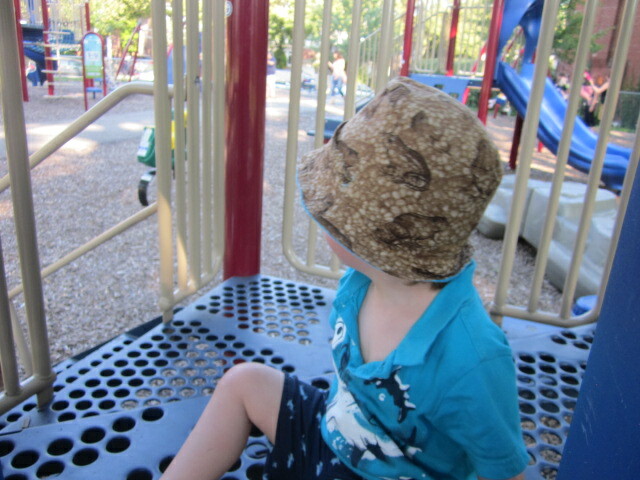 Summer is my busy season, and now that the kids are back at school (N is in a toddler program this year – more on that later, on my other blog.) I have more time for sewing, blogging, etc. That being said, I did manage a bit of sewing over the past few months, and I’m pleased to share my projects with you through this weekend. So much of my sewing begins with a problem to be solved. 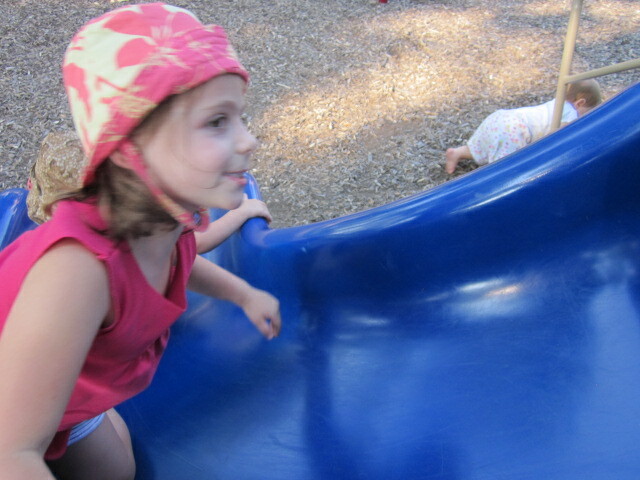 This time, my kids had outgrown their baby hats and needed something cute to put on their heads. Armed with a free pattern (will link to it soon) and some adorable fabric from Sew Sisters, I whipped up a few hats one day. 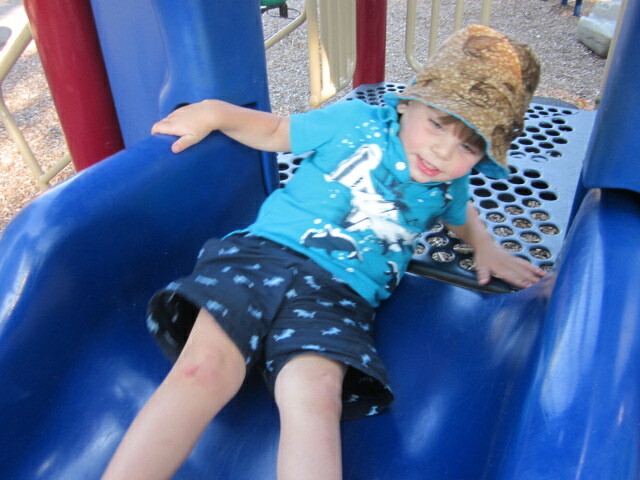 Then we went to the park. 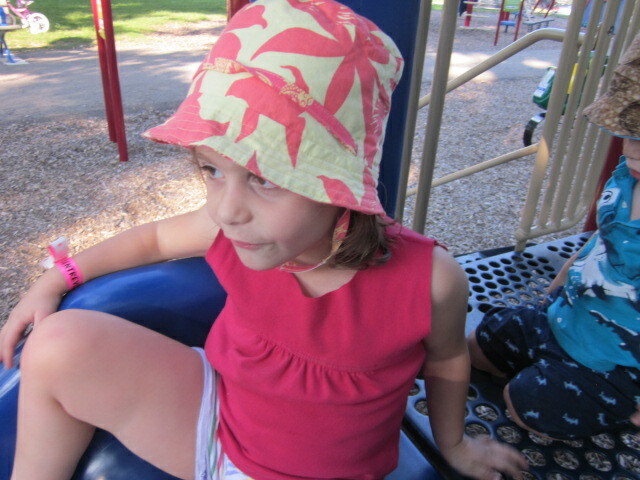 The hats are reversible, as you can see in the last two (not fabulous) photos. What’s truly awesome, though, is that I figured out how to make the strap reversible as well. Okay, maybe “reversible” isn’t the right word, but I figured out a way for the strap to be usable on either side of the hat without it pulling the brim flat against the child’s ears (a pet peeve of mine.) Maybe one day I’ll post a tutorial for that. In the meantime, one child is screaming and the other is waiting very patiently to watch Mickey Mouse on my computer, so I must go. Come back again soon – I’ll be deciding on (and announcing) specific days that I’ll post every week. … and how was your summer?